There are so many variations for potato salad - warm, cold, mayo based, vinegar based, etc. I personally like potato salads that are mayo based for that creamy texture, especially when there are hard boiled eggs tossed in. 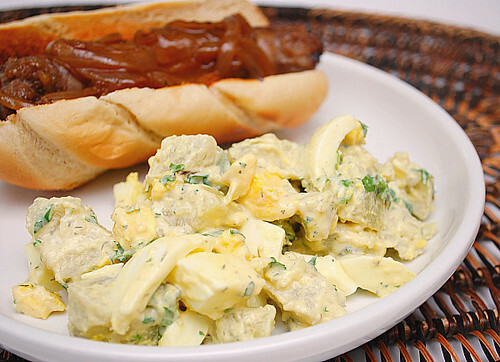 It's like a two-for-one deal with an egg and potato salad combo! I came across this recipe for potato salad from Tyler Florence. What's great about it is that not only does it use potato and egg, the 'dressing' is very flavorful with a bit of tang. From the original recipe, I added an extra egg and substituted pickle relish instead of dill pickles called for. It was certainly a delicious accompaniment to the beer braised bratwursts and caramelized onions we had for lunch! Put the potatoes into a big saucepan of cold salted water. Bring to a simmer and continue cooking the potatoes until a paring knife poked into them goes in without resistance, about 15-17 minutes. Drain the potatoes in a colander and let them cool. Meanwhile, stir together the mayonnaise, mustard, pickles and their juice, onion, remaining scallions and capers, parsley, dill, and lemon juice in a bowl large enough to hold the potatoes. Roughly chop the eggs and add them into the bowl. Stick a fork into the potatoes and lift them 1 at a time out of the colander. Break up the potatoes by hand into rough chunks, add them to the bowl and toss to coat with the dressing. Season, to taste, with salt and pepper. Drizzle with a little olive oil before serving. * To make ahead/freezer meal - Prepare the potatoes in advance by cooking until cooked. Allow the potatoes to cool and wrap each potato individually in foil. Place all the foil wrapped potatoes in a large freezer bag and freeze. When ready to prepare, defrost the potatoes completely. Remove the peel with a paring knife and cube the potatoes. Place in a microwave safe bowl and heat in the microwave for 2 minutes. Allow to cool while you prepare the dressing and boil the eggs. Assemble the potato salad by tossing the potatoes with the dressing and egg, folding it all together to combine. Season, to taste, with salt and pepper. Drizzle with a little olive oil before serving.